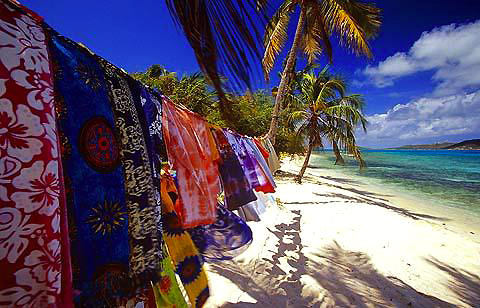 These colorful sarongs for sale at Petit Bateau Beach, Tobago Cays, caught my photographers' eye one dazzling afternoon during a sailing cruise aboard Star Clippers' flagship vessel, Royal Clipper, a gracious 227-passenger, five-masted, luxury sailing ship. The beaches and reefs of the Tobago Cays, a tiny clutch of four uninhabited islands in a chain of 30-plus that form the Grenadines, are the quintessential escape for snorkelers and yachtsmen. In fact, if you're visiting Tobago Cays - you've arrived by boat.